As a curious, erudite 50-year-old with an interesting life, Neil Tennant is entertaining on almost anything you care to throw at him – music, art, politics, travel – and as an ex-journalist (he wrote for Smash Hits from 1982-85), he’s careful to entertain in quotable form. You could just leave Neil alone with your tape recorder, let him rattle on for an hour, come back and you would have more than enough material for an article. Mostly, he’s interviewed with his fellow Pet Shop Boy, Chris Lowe, who doesn’t talk as much. What Chris does is punctuate Neil’s flow, deflate his theories with a daft comment or snuffly jokes. This corresponds with the way their music is commonly viewed: Neil’s romantic, clever lyrics, skewered and made hilarious by Chris’s disco-bunny beats. Though, of course, it’s not as simple as that. 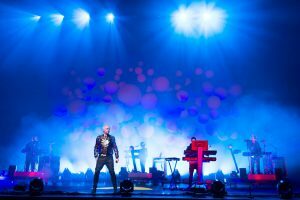 Plus, the Pet Shop Boys have often chosen to branch out from straightforward pop – into art (collaborating with Sam Taylor-Wood), West End musicals (they wrote Closer To Heaven with Jonathan Harvey) and one-offs, such as co-compiling an LP of Noël Coward songs or writing a piece of music to accompany 1999’s total eclipse. Over the 23 years they’ve been together, they’ve worked with people as varied as Zaha Hadid, Derek Jarman, Dusty Springfield, Liza Minnelli, Bruce Weber, Martin Parr and Johnny Marr. Although we are in a recording studio, today isn’t a straightforward pop day – as we shall see. Well, Chris is in the studio with a couple of techno boffins and DJ/producer Dave Dorrell; Neil and I are in the room next door. Chris isn’t doing this interview. Probably because he can’t be bothered. Doesn’t that annoy Neil? Neil is nervous about what’s going to happen: ‘I keep waking up in the night, panicking.’ There are so many factors – whether anyone will turn up (free events mean no advertising and a less committed audience), whether the weather will hold. Recently, La Bohème in Trafalgar Square was cancelled 15 minutes before its start because of freak weather. Neil was there: ‘It was terrifying to see,’ he says. Due to problems with sponsorship (everyone involved is doing this for free), the ICA had to push the original performance date back, which gave Neil and Chris even more time to immerse themselves in the project. Typically, they decided they wanted an orchestra, although they had been told ‘no’. Then Neil was listening to a contemporary German classical music CD, Mein Herz Brennt , composed by Torsten Rasch and based on the music of terrible rock band Rammstein. Neil thought it was a great CD, and emailed an address on the back asking if Rasch would get involved with the Potemkin project. Much to-ing and fro-ing later – Rasch’s initial compositions were too avant garde, even for the Pet Shop Boys – and now Sunday’s performance will include entirely new contemporary classical musical passages played by the 26-piece orchestra from Germany which is flying in specially. ‘So ha! to no orchestra,’ says Neil. I start to talk about the 2003 anti-Iraq war demonstration, the biggest ever seen in Trafalgar Square. This chimes with Neil. He was pro-war, because he read The Threatening Storm, a book written by ex-Clinton administration stalwart Kenneth Pollack, who considered all the options for dealing with Saddam and came to the conclusion that regime change was the only choice. Apparently, The Threatening Storm was required reading by Bush’s team, and, Neil insists, was what led Blair to the same conclusion. Anyway, Neil read it too, and agreed. Tennant is utterly absorbed in this project, thoroughly taken over. Yet he can’t help himself; he will spin off into less serious subjects. From discussing political futility and apathy, we somehow find ourselves talking about Smash Hits. My first writing job was there, three years after Neil had left, and both of us adored the magazine when we worked for it. I say, rather idly, that I think Smash Hits’ particular approach to the world in the Eighties – pop music and jokes – has taken over the whole of the British press. Neil, who used to be assistant editor, pounces. When he’s at his house in Chelsea, Neil goes out all the time. At his other home, in county Durham, (Neil is originally from North Shields), he stays in and works with Chris. It was there that they wrote most of the Battleship Potemkin score. Neil’s recording routine is: get up at 9.30am, have breakfast listening to Radio 3 and reading a magazine – New Statesman, The Spectator, Word, Frieze, the TLS. No papers: ‘They have too much stuff that isn’t news in them. I think someone should publish a paper like the ones 100 years ago, all the adverts on the front and then, inside, nothing but news. No pictures.’ After a spot of emailing, it’s into the studio about 11.30am (Chris will have stayed the night in his part of the house). Work, lunch, work, then a glass of wine at 7 o’clock ‘on the dot’. Dinner, then more work. That’s when they get most done, possibly because of the alcohol. Which is, of course, one of the messages of Battleship Potemkin. We go into the studio to watch the Odessa Steps sequence with the Pet Shop Boys’ music. I’d forgotten the power of those terrible images – the gothic faces, the scampering panic, the static, deliberate murder. And watching them, hearing Neil’s plaintive voice over swelling, mournful music, I feel overwhelmed. And this, on a tiny screen, in a room filled with techno-bods. If they pull it off, next Sunday’s event should be a head-shatterer.